MagnumStone™ is perfect for DOT (department of transportation) industrial and commercial retaining walls that require a more aesthetic look. Ideal for gravity and geogrid retaining walls, soil nailing, cantilevered, plantable, mechanical geogrids, and a gravity extender, the flexibility of our MagnumStone™ retaining wall units are endless. Incredibly realistic looking, your MagnumStone™ retaining system brings the same stability of other industry products, but with less the cost and greater visual appeal! Machine install big block system for tall and short walls where stability is needed. MagnumStone is a large wet-cast retaining wall system, cleverly engineered with a hollow core. Its hollow design uses nearly half the concrete of a solid system while maintaining all of its strength and durability. MagnumStone’s hollow core allows production facilities to maximize their output and reduce their carbon footprint. 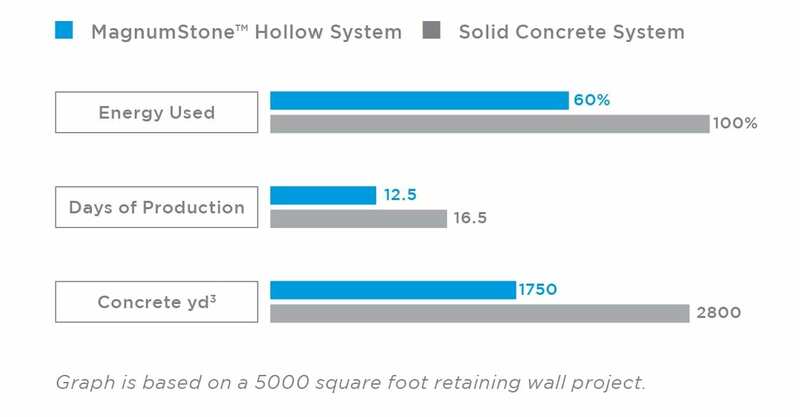 Its unique hollow core design means less concrete to pour, making the units lighter for handling purposes and reducing the amount of cement required per block. The MagnumStone 8 sq face ft is light enough to be moved on site in pairs of 16 sq ft with a standard bobcat. The large light weight hollow core MagnumStone units can be installed quickly, to create curves and turn corners, with smaller equipment and less labor. 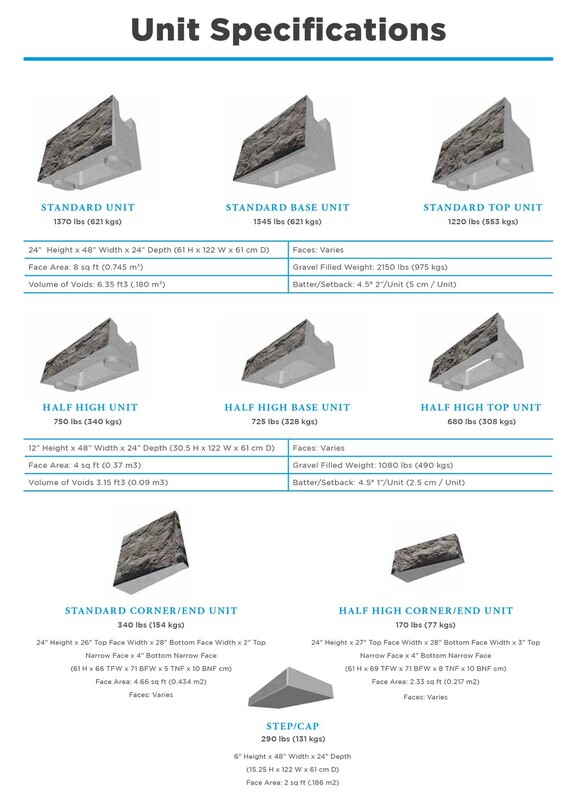 MagnumStone™ was designed for the end user by providing many options for solving nearly any contractor wall problem. interlock. The wet-cast manufacturing process provides the units with high strength, low absorption and great freeze/thaw results. Tapered sides make it easy to build tight curves and straight walls with complete accuracy. The MagnumStone’s vertical and horizontal hollow core, filled with clear crushed gravel, provides added weight, an excellent wall drainage system and a superb connection with the geosynthetic reinforcements. BURNCO produces MagnumStone in the ledgestone face.